A weekend meteor shower created by the leftover bits of the famed Halley's comet is thrilling skywatchers around the world, who captured amazing photos of the cosmic light show. The dazzling "shooting star" display was sparked by the 2011 Orionid meteor shower, which peaked before sunrise on Saturday (Oct. 22). The meteor shower is visible in the southeastern sky and appears to emanate from the constellation Orion, the Hunter (hence its name). Skywatcher Kendall McDonald was out for a jog in Niceville, Fla., late Friday and happened to spot meteors from the Orionid display. "I have no pictures but I always find it cool … I just was out running and always look up in the sky," McDonald told SPACE.com in an email. The Orionid meteor shower is one of two annual displays created by a dust stream from Halley's comet, which visits the inner solar system once every 75 years or so (It's most recent visit was in 1986). While the meteor display peaked today, Orionid meteors should still be visible to patient skywatchers with clear, dark skies through the weekend. Here are some basic meteor-watching tips: Dress warmly to guard against the October chill during long observing hours, and settle into a comfortable chair that allows a reclined position to gaze at the sky. "Meteor counts by international observers confirm that the shower is underway," the skywatching website Spaceweather.com wrote in an update. "The best time to look is during the hours before sunrise." This NASA sky map shows morning sky on Saturday, Oct. 22nd at 5:30 a.m. local time, viewed facing southeast, the location of the Orionid meteor shower created by leftovers from Halley's Comet. "The weather is perfect but ice cold at night," Staiger told SPACE.com in an email. "I just wanted to try my luck with the earthgrazers, when the Orionid radiant is just about to rise. And I was lucky. This bright meteor was flying from one horizon to the other. It was not a bolide nor huge fireball, but still a very bright Orionid AND it was a grazer, thus lasted about 4 seconds to fly across the sky from NE to NW." 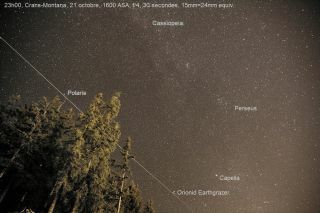 Staiger, like several other 2011 Orionid observers, posted his photo on Spaceweather.com and shared them with SPACE.com. The image shows a brilliant meteor streaking over alpine trees with a starlit sky as the backdrop. While Staiger saw a few non-Orionid meteors, his photo captured the only Orionid meteor he saw during the peak before the October chill drove him indoors. "Maybe there were more later with Orion rising higher but it was too cold for me to stay out all night," Staiger said, adding that he hopes to try again tonight. Staiger's note offers a lesson for skywatchers hoping to catch a final glimpse of the Orionids this weekend: Dress warmly. A blanket and a comfortable chair are must-haves for long meteor-watching campaigns during chilly October nights. Just east of Veszprem, Hungary, amateur astronomy Monika Landy-Gyebnar reported seeing brilliant, long green trails from Orionid meteors despite cloudy conditions over one of her favorite skywatching spots — a place with clear viewing to the south and east. "The Orionid shower of this year was average, but the long green trails made it memorable!" Landy-Gyebnar said. "The weather here in Hungary is usually not too good in autumn, so I still feel lucky. Most of our country was completely overcast, only a few observers could see the shower." After three hours of meteor watching, Landy-Gyebnar cut her Orionid photo session short due to a thick layer of frost that covered her camera lens. She added that she watched the Orionids alone because her husband abhors cold weather, and fall and winter skywatching assures no pesky mosquitoes. "I love being alone under the stars as this helps a lot to clear my mind after a week of work, only the sky with its complete, calm beauty!," Landy-Gyebnar said. The Orionids were also posted by skywatcher Brian Emfinger in Ozark, Ark., who made sure to use the right camera lens and settings to catch some of the dimmer meteors. "This year's Orionid Meteor Shower was pretty much what I've come to expect of it except the weather was absolutely perfect this year," Emfinger told SPACE.com in an email. Emfinger spotted several Orionid meteors during his observing time, but also caught one unexpected surprise. Like Landy-Gyebnar, he spotted a meteor that wasn't associated with the Orionid meteor shower. "The third nice meteor image I caught was not an Orionid but it left a smoke trail that persisted for several minutes (it actually was just outside the constellation Orion but was nearly opposite the radiant)," he said. The Orionid meteor shower is actually the second well-observed meteor shower of October. On Oct. 8 the annual Draconid meteor shower, created by bits of the comet Giacobini-Zinner, hit its peak. The next major meteor shower will be the annual Leonid meteor shower, which peaks around Nov. 18. Editor's note: If you snap a great photo of the Orionid meteor shower and would like to share the image and your comments for a possible image gallery or story, please contact managing editor Tariq Malik at tmalik@space.com.